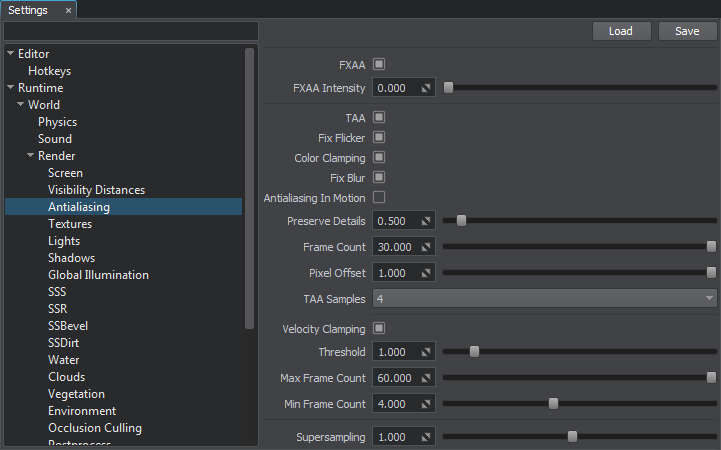 This section contains settings of anti-aliasing: both the Temporal Anti-Aliasing (TAA) and Fast approXimate Anti-Aliasing (FXAA) can be configured here along with supersampling ratio. Toggles improved anti-aliasing in motion (for moving camera and objects) on and off. Can be controlled by render_taa_antialiasing_in_motion console command. Enables the velocity clamping. It performs reprojection of pixels of the previous frame taking into account the velocity buffer and mix the result with pixels of the current frame. It reduces blurring and ghosting in dynamic scenes with a lot of moving objects. This gives us a quadratic dependence, which means that when you set supersampling_ratio equal to 2 you'll have x4 pixels. The table below demonstrates how supersampling ratio affects the number of pixels.